As ever, Virgil van Dijk gave little away. “You need to be aware of the qualities of every striker you face, as I always am,” he said of Robert Lewandowski earlier this week. “But sometimes you need to be smart and more than 100 per cent ready for anything. Liverpool certainly heeded such sage advice at Anfield. Lewandowski had the fewest touches of any starter, including goalkeepers, with Fabinho and Joel Matip restricting him to a single off-target shot. This season’s Champions League top goalscorer was nullified and neutered. Sevilla and Napoli are the only two sides he has faced more than once and failed to score against in the Champions League. Only six players have outscored him (19) in knockout history. The stage is set. But Van Dijk returning from suspension is a part of the script that Lewandowski would rather forget. Liverpool have kept 28 clean sheets in the Dutchman’s 58 appearances, conceding more than once just 13 times when he has started. A defender with so few weaknesses has been exposed by so few strikers. 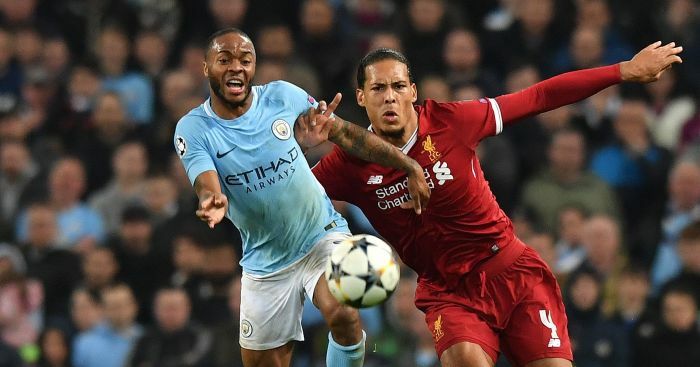 Van Dijk might feel like an added luxury to a Liverpool side that did wonderfully to keep a clean sheet in the first leg. But it came against a Bayern side reluctant to attack, one who came for and left with a goalless draw. The onus will be on the hosts to show more adventure at the Allianz Arena, so the visiting defence will be under greater strain. Van Dijk will be needed. Bayern have scored 11 goals in their last two games, with Lewandowski accounting for four of them. 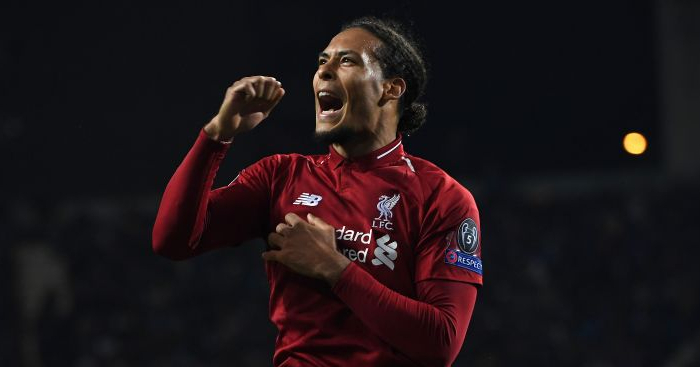 Liverpool have kept five clean sheets in their last six matches, with Van Dijk present for four of them, and even taking the time to score two goals himself against Watford. The meeting of unstoppable force and immovable object could decide the game. Bayern are unlikely to lay out the welcome mats in Germany, with Hummels hoping to repeat his first-leg heroics. The German was excellent at Anfield, gliding across the turf with unerring nonchalance, unnerving grace and all the effortless cool of an automated air con system. Liverpool could not find a way over, under or through Hummels, who resisted almost every advance towards his goal. It was one of only six times this season the Reds have been restricted to as few as two shots on target, and the second at home. Firmino, as with Lewandowski, had just one off-target shot in 90 minutes, although he did manage to create three chances. The Brazilian has had something of a frustrating individual season despite his team’s great success, proving his importance to the overall cause. A return of 13 goals and five assists this season is ostensibly a poor record for a centre-forward at an elite club, but there has always been much more to Firmino’s game. Hummels will be more than aware of the 27-year-old’s selfless brilliance. 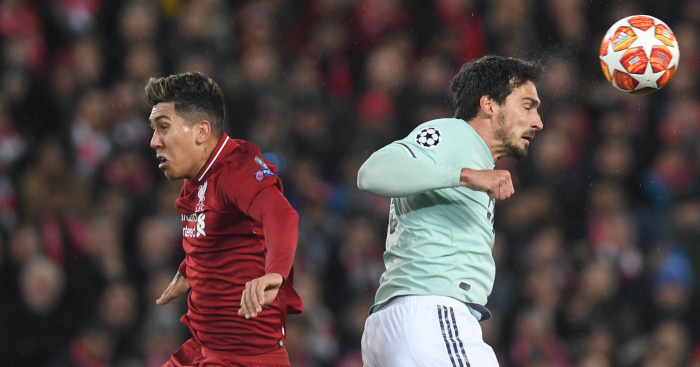 He has faced Firmino nine times between 2011 and 2019, first when the pair were at Hoffenheim and Dortmund respectively, then when Firmino joined Liverpool, and now with Hummels at Bayern. Hummels has scored more goals (2) than Firmino (1) in their 624 minutes against each other. But Firmino was used as a No 10, right-winger, left-winger and support striker across those matches, filling in wherever necessary as the supporting cast to the main characters. Under Jurgen Klopp, his position has never been more certain or more central. Hummels is Bayern’s defensive drill sergeant; Firmino is Liverpool’s attacking fulcrum, integral to the cause regardless of form. Sunday brought his first goals since January. A similar performance would be welcomed. The absence of Joshua Kimmich cannot be underplayed. His yellow card in the first leg leaves a gaping suspended hole on the right side of Bayern’s defence, signposted like a weak point glowing bright red on a mid-game Super Mario boss. Jerome Boateng has ever so kindly offered to fill in, insisting he “would not have a problem with” playing in a position he excelled in at Manchester City. But the most likely solution is for Rafinha to step up to the vacated plate. The 33-year-old did start both of Bayern’s recent comprehensive Bundesliga victories over Borussia Monchengladbach and Wolfsburg, but at left-back. David Alaba’s recovery from injury facilitates Rafinha’s return to a more natural role on the right – although a third start in 11 days for an ageing reserve poses its own problems. Sadio Mane will be more than happy to take advantage of the situation. He is no longer the forgotten man, the third wheel of this fearsome Liverpool attack. The Senegalese is just three goals behind Salah’s tally of 20 for the season, and has eight in his last nine games. That he has half the number of assists but three more goals than at this stage last season suggests that either his role has changed somewhat or he has simply embraced a greater responsibility during Firmino and Salah’s respective dry spells. Perhaps it is somewhere in between. But if he is still unaware of how good he is, 90 minutes against a potentially tired veteran in Rafinha – or an out-of-position centre-half in Boateng – should be a revelatory experience. Niko Kovac could introduce Kingsley Coman straight into the starting line-up after his return to training on Monday, but it would be a risk. The Frenchman has started just ten games in an injury-hit season. To be frank, Ribery has earned his chance. A hat-trick of assists as a second-half substitute against seventh-placed Wolfsburg on Saturday was a timely reminder that while his best years are undeniably beyond him, the 35-year-old is still a fine option. That could persuade Kovac to keep the winger on the bench in the hope of replicating such an impact. But this could be the final Champions League appearance of Ribery’s Bayern career, and the manager is more likely to use that as motivation to coax a throwback display out of him. Ribery and Trent Alexander-Arnold have met before, albeit during a pre-season friendly in 2017. It was there that the right-back, having only made his maiden Premier League start earlier that year, left his mark with an odds-evening foul in a 3-0 win. “He didn’t say anything,” Alexander-Arnold later said of the incident, “and I didn’t think of asking him for his shirt as a souvenir or anything. I just went straight into the changing room because that is what I am used to doing. Just over 18 months later, the two will be reacquainted on a much grander stage. Ribery, representative of a glorious past, will still back himself against a player 15 years his junior, one who has the present and future in his hands. Not since Sonny & Cher have two single-name superstars made such beautiful music. But mononymous midfield masters Thiago and Fabinho could combine on Wednesday for an absorbing clash of styles. The latter’s drop back into defence starved us of this clash in the first leg, which Thiago sprinkled with his usual insouciant excellence. He created the most chances of any Bayern player (3) without ever shifting too far out of second or third gear. But he also did a fine impression of Fabinho, with more ball recoveries than any player (9) in an accomplished, disciplined performance. 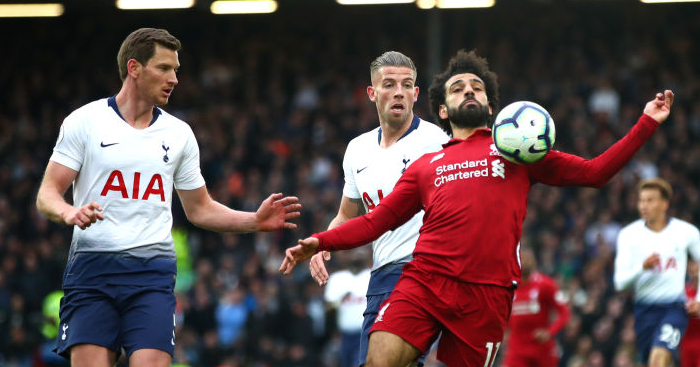 Jordan Henderson matched him pass for pass and tackle for tackle at Anfield, but it seems more likely that Fabinho will be tasked with shutting the Spaniard down in Germany. 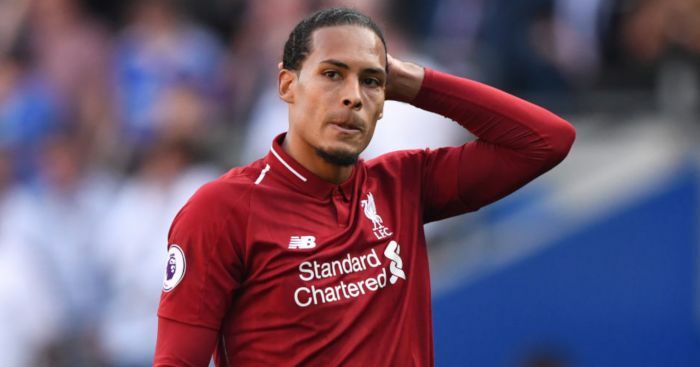 He has played a mere 47 minutes of Liverpool’s four Premier League and Champions League defeats this season, not starting any of them. Having been hailed for his first-leg display, he will be required to pick up where he left off in a different position. 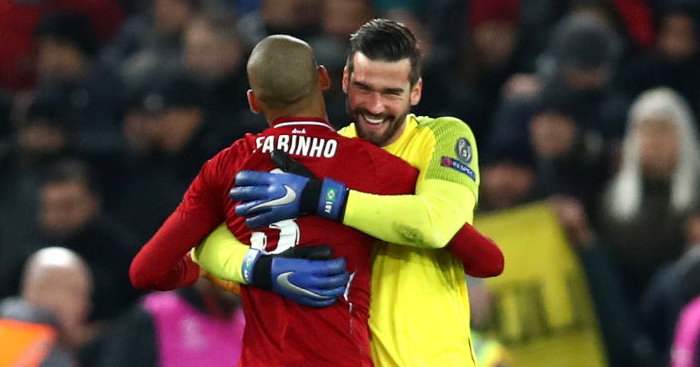 Thiago will only make the transition more difficult, but Fabinho has risen to almost every challenge he has been set since he established himself at Liverpool in late October. Can the monolith overcome the metronome?